if there is one thing that the modern day church needs more than anything else, it is a spirit of prayer. however, little actual value is placed on prayer in both our personal and corporate lives. in a recent post, i asked you my readers for feedback on what you want to hear more about on this blog. one specific request that struck me deeply was a request to read more about prayer. my husband and i are in full time ministry doing just that - prayer. we oversee the building of a house of prayer community in redding, california, and much of our time and energy is both in the place of prayer and encouraging other believers to grow in their own prayer lives. we gather believers to corporate worship and prayer times to join our hearts in encountering the living God and to partner with Him in His purposes for the earth. although i have given my life to this thing called prayer, i feel as if there is so much i have to learn! i am always hungry and open to teachings and advice on how to deepen my own life in prayer. i recently heard a good friend teaching in a sunday school class on prayer say something i have been thinking about for the past couple days. he said that we do not have a hunger to pray because we do not spend time in the Word. if we were in the Word more, it would stir our hearts to pray. so, it seems that the lack of prayer in the church and in our own personal lives could actually be a reflection of the fact that we do not actually spend much time in the Word. do i want to stir a deeper hunger to spend time with the Lord in prayer? then i need to make sure i am daily reading and meditating on His Word - the Bible. am i feeling unmotivated and unmoved in talking to the Lord in prayer? how has my time in the Word been the last couples days, weeks, or (gasp) months? in thinking about my own experience with developing both a prayer life and a life in the Word i can pinpoint some specific ups and downs in both. i can see a pattern for myself of times i have been too busy to really read the Bible and then feeling disconnected in prayer and times when i have pressed in to read the Word (even in the small seemingly insignificant moments) and feeling my heart drawn to talk to the Lord. though it may not be a perfect rule, i believe my friend is right in that they are very closely tied. for me, one of the greatest gifts of revelation i have had in the past year or so is that it is legal to pray for myself. i have always had a prayer list of people and issues that i pray for and then i also just use my prayer times to "vent" to the Lord instead of to men (i got this from studying the life of david and saw it to be a powerful part of his life). 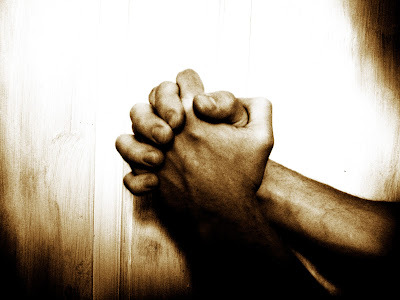 i hadn't occurred to me to use a portion of my personal prayer time to just pray, "God, give me a Spirit of prayer. give me a desire to pray. please give me the grace to follow You and desire You and spend time with You." this sounded totally crazy to me, and yet it is totally a legal prayer. king david would often pray for himself in the psalms. Jesus said that the Father would give the Holy Spirit to all who asked Him (luke 11:13). we can totally ask for the Holy Spirit to strengthen our prayer lives and He will! this has been such fuel for me! the times when i come to the Lord and feel so untouched and unmotivated to be there, i now simply ask that He would send the Holy Spirit to stir me to desire to pray. so simple and yet it works. another thing that i have learned over the past couple years of focusing on growing in prayer and building up the house of prayer in redding is how weak i often feel. my initial thoughts were that a life of prayer would make me feel like i was on top of the world, but that isn't exactly how it works. it isn't meant to work that way. there are so many places in Scripture that say that the Lord delights in those who know their own weakness and lean on Him. He is near the broken and contrite in heart (ps 51:17). in Jesus's first publicly recorded sermon He begun by saying, "happy are the poor in spirit..." the Lord values our recognition of our own weakness and this is a purposeful byproduct of a life in prayer. when we are weak, He becomes strong in our lives. i thought that i would discover a source of real power through prayer. instead i found weakness - mine. it seemed that with more prayer i would rise to a place of powerful ministry. instead, i am filled with an awareness of inability to handle power. my eyes have turned from my grand future to a grace-filled present. i'm not disappointed, just surprised. i figured that with more prayer i would become pure and holy. it seems that instead, i have become aware of my impurity. when i thought that my heart would jump at the chance to be holy, i found it to be coarse and vain. i do sense a change happening in me, but i realize now that it's not as much from my heart as it is from His. i'm not disappointed, just surprised. more prayer appeared to be the key to the miraculous. certainly if i pray more there will be more miracles happening through my life. it's true that i see more miracles. but so far it's not that they have increased as much as i see my world differently. i'm not disappointed, just surprised. with more prayer, i would discover the "riches of Christ," right? my first discovery was my spiritual poverty. as for His riches, they fill my heart only as i see my need. i'm not disappointed, just surprised. if there was one thing that i knew for sure, it was that more prayer brought more answers. my shock came when i realized that i don't have more as much as i have different answers. i'm not disappointed, just surprised. this is where i have been myself. i have discovered in a life of prayer much surprise about both myself and God. but i am not disappointed. this is the life we are called to as believers. we are called to be joined to Him in prayer and truly discover what it means to know Him and live leaning into Him. i encourage you to take some time today to go to that place of prayer to encounter His heart. has it been a while? does your heart feel cold? ask Him to give you the grace to pray. ask Him to give you the Holy Spirit to strength and encourage you to pray. He will give to all who ask. what is one thing you have discovered in pursuing a life of prayer? what is one obstacle you have faced in trying to develop your own prayer life? i would love for you to add your thoughts in the comments below.